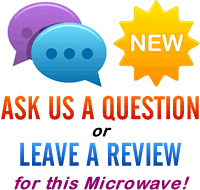 Are you after a cheap white microwave? The KOR6L15 from Daewoo offers 20 litre capacity, as well as 700w of power, all for under £40. On first glance this represents excellent value for money - we review the Daewoo KOR6L15 to see just how good it is. 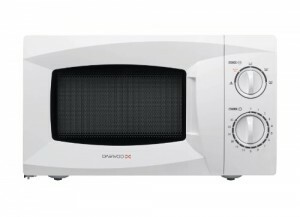 Finished in white, this Daewoo microwave oven is cheap and compact, taking up very little room. Measuring approximately 46cm by 36cm by 28cm, the KOR6L15 is ideal for those who require an inexpensive microwave for heating and cooking food. The price tag will make it appeal to students, work places, and those looking to furnish their home on a budget - if you're just looking for a basic microwave oven model, then why spend more? To operate it, simply select the power level, and then set the time dial, and you're away - just two dials - it is incredibly simple to use, and will be ideal for those who may struggle with technology, such as the elderly. During the test period it cooked evenly, and keeping it clean is easy - with the inside wiping down to look new again. At this price range, you can't really expect much in terms of functionality, however in terms of being a simple method of heating and cooking food, the Daewoo KOR6L15 offers exceptional value and performs pretty well. Granted, it doesn't necessarily look as stylish as a top end microwave, but considering the low outlay, our testers were very impressed with the KOR6L15. The instructions are clear and simple to follow - but to be honest the majority of users will not need require these when operating this KOR6L15 microwave, due to it's basic dual dial control system. All in all the KOR6L15 is a pretty basic and cheap microwave, but it has proven to be reliable over the weeks that we tested it, and the price tag of £40 means it represents amazing value for money. If you're on a budget and require a simple method of heating, re-heating and cooking, then the KOR6L15 won't let you down. The Daewoo KOR6L15 is an excellent value, and reliable microwave. If you're looking for a simple to use budget microwave, then look no further.